The thing about reviewing a game that is a spiritual successor to another one is that if you already talked about the first it’s harder to find anything new to say about the second. That was the problem we had when we spoke about Codenames Pictures, as I noted at the time. 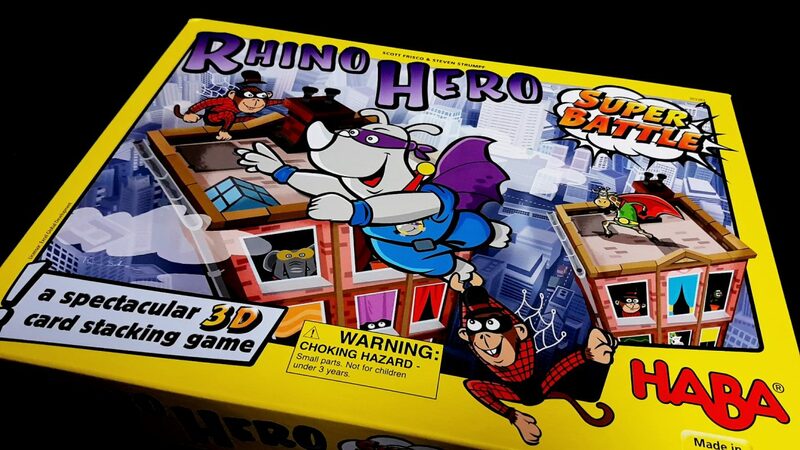 We have a very similar issue here with Rhino Hero: Super Battle because it’s basically an expanded version of Rhino Hero, a game we have already reviewed for the site. Much of the feel of the game is the same, even if the specifics change. Forgive me then if this review is a little more cursory than what we usually do around here. I’ll work on the assumption you’ve gone and read the Rhino Hero review. If you’re busy and want the TLDR of Super Battle – it’s like that, but better. 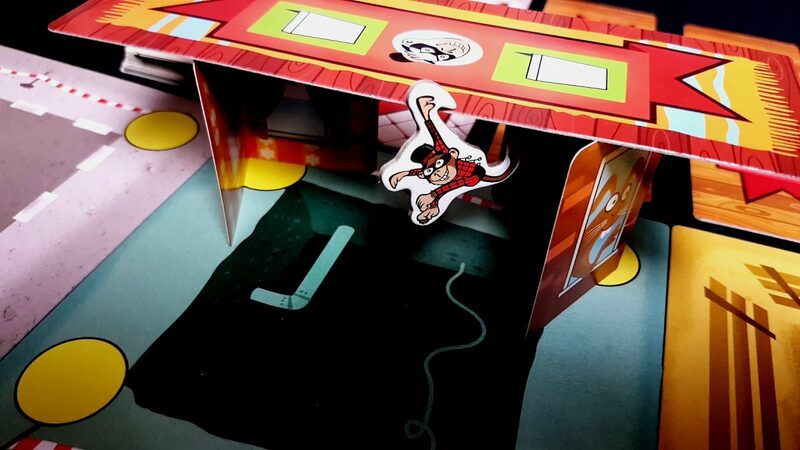 The basic take-away from our review of Rhino Hero was ‘Far more fun that it should be for the design and the price’. That’s true but there’s only so much fun you can have over the long term with a deck of cards and a shoogly tower. Super Battle doesn’t mess with the basic formula, understanding that the core of the game is bags of fun without needing the addition of lots of new complications. Super Battle doesn’t look to add depth – instead, it adds width. The result is something that is meaningfully better than the original without being much more difficult to play. The designers over at HABA clearly understand what it is people like about their games, and double down heavily on those elements that have been most convincingly demonstrated to have worked. Super Battle then makes everything bigger and more varied. Different cards, different heroes, and a system that incentivises the building of ever more intricate and interrelated structures. More important than this though, Super Battle adds a narrative arc to the game that manages to effectively elasticise the game experience. 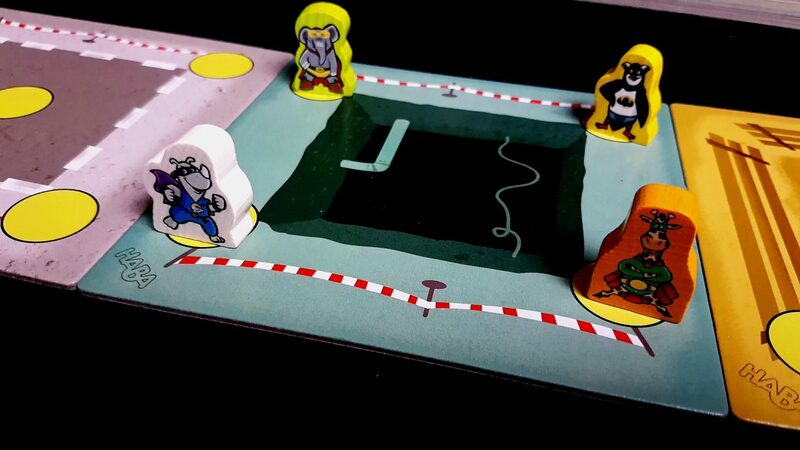 Rhino Hero could be very exciting to play as the game went on, and that excitement continued to mount until the thrilling finale. Super Battle gives you a more nuanced way to approach the ebb and flow of tension in play. It lets you bend and stretch the electricity of the fun without losing any of its charge. The basic pitch is this – each of your players takes control of a weighted piece that represents your super hero. Three foundation boards are placed on the table, and each of these has a number of build points available. The first cards you play in the game must make contact with one of these build points. 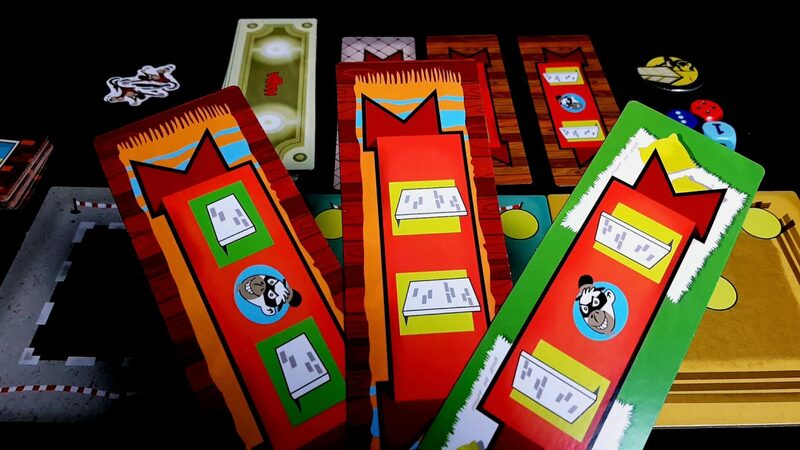 Each player is dealt out three roofs, and those roofs indicate which cards are to be used to build the walls on which they will sit. Roofs may be given one wall or two walls, and any combination of small walls and long walls. You can place new walls on previous roofs but you can’t have previous roofs act as structural elements for new roofs. Some roofs also have a spider-monkey symbol on them, and when you place a roof that has one of those you need to hang a little cardboard figure precariously from its edge without knocking anything over. You then roll a die to see if your superhero ascends or descends the complex you have all been building. If your hero occupies the same level as another hero there is a SUPER BATTLE decided by dice, and the loser of that battle is sent down a level. The hero that is highest in the structure is the current leader, and the actual winner is determined by who eventually knocks the whole lot over when playing their roof card. Spoiler – it’s not them. See, what all this does is permit you to have some control over the pace of the game by giving you meaningful choice over where your roof is going to go. In Rhino Hero it always went on top of the last one and that meant you were driven to keep making the tower as rickety as you thought you could get away with. That guarantees a very agreeable escalation of risk as the tower grows, but it also means that play becomes predictable. Every card is going to be harder to play than the last card. You can lay traps for people and the only uncertainty is whether your trap will spring. You don’t need to worry about whether or not they’re going to stumble into it. Super Battle changes that by giving players autonomy as to where they’ll place their card, and the structure you’ve all been collaborative architecting will provide whole suite of meaningful options around that. Those options will draw in position, precarity, and the confidence each player has in their ability to work within the constraints of the construction. Maybe you place a really dodgy roof on a really dodgy wall hoping that it’s just on the right side of robustness for you to make it stay, but not so robust anyone will want to build on it. There’s nothing to stop another player looking at what you’ve done and saying ‘blow that’ before placing their own roof somewhere different. Eventually your structure will become so interconnected that every placement impacts on every other card but that doesn’t mean every point of play is as risky as every other. More than this, each player will have their own views on what is risky and what is not. You might find yourself driving the next player towards the place you want them to build only to find they had different ideas as to the destination of their own card. That in turn adds a very nice element of resource conservation into play – you want to keep those safe spaces free until you really need them, but they’re safe spaces for everyone even if each player has a different view on just how safe they are. You want to use them at the time where they yield their maximum benefit but that’s the same thing that everyone wants to do. As such every turn becomes a kind of architectural roulette where you weigh up the odds of success versus the potentially wasted opportunity of playing it safe. Someone is going to use the safest part of the structure to play their roof. You want it to be you, but you don’t necessarily want it to be now. You want it to be when not playing it safe is too risky to contemplate. The result of all of this is that Super Battle has a flow of play that expands and contracts, and in the process it permits meaningful tactical consideration. The nature of the card play and the simple physics of stacking also means that at least to begin with the whole building you’ve been collaborative screwing up is relatively stable. The lower levels of this erratic erection tend to be solid and that means people will usually build outwards rather than upwards. That in turn means that you end up playing with something that looks really cool because you get the space to take your time and are incentivised to do exactly that. The towers and turrets of your building are almost always going to get enjoyably tall. 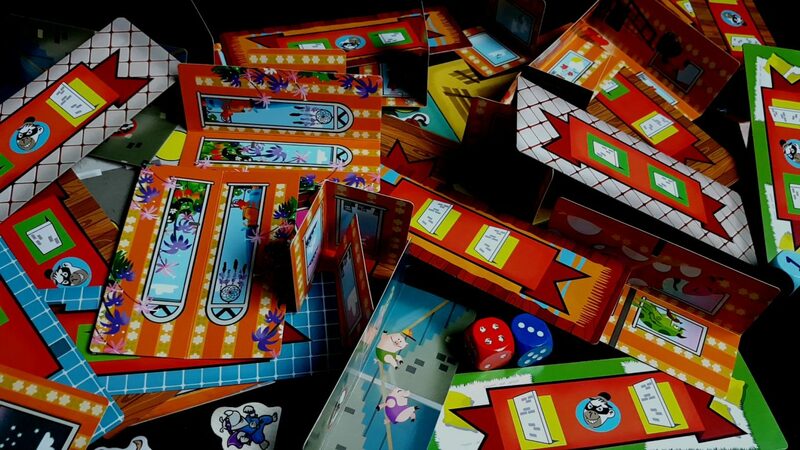 What you lose in the razor-sharp increase of tension from turn to turn in Rhino Hero, you gain back in the delayed gratification of genuinely satisfying destruction. This also ensures that before too long you can’t nudge one card without nudgnig all of them because it’s inevitable that you’ll have to make use of other roofs to support new roofs. Many roofs need a long and a short wall and you can’t have roofs placed at a slope. Before too much time has passed your whole edifice has the internal interconnectivity of a haphazard hive constructed by bees doped up on LSD. The entire rhythm of the game then basically works towards making sure things get big and things get tall. This means that when the last player actually does make the move that causes the whole thing to come tumbling down there’s a proportionate payout for the work you did. 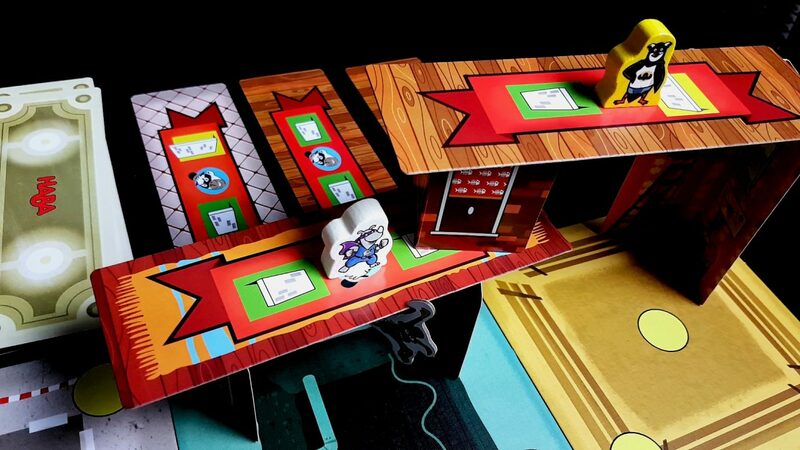 It’s not that this is necessarily better than what Rhino Hero accomplished but it’s different and in a way that I personally believe makes it a more genuinely enjoyable experience. 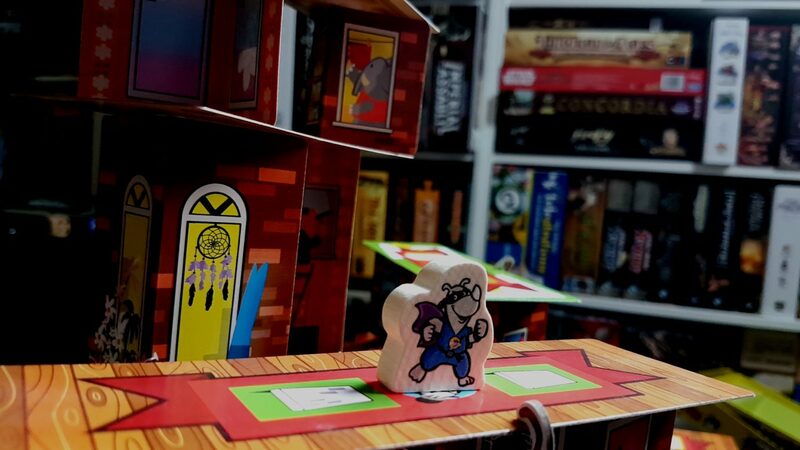 It gives you more opportunity for skilful and strategic play, but it never loses the core of what makes Rhino Hero itself worth playing – the sheer anarchic fun that comes from destroying something beautiful. 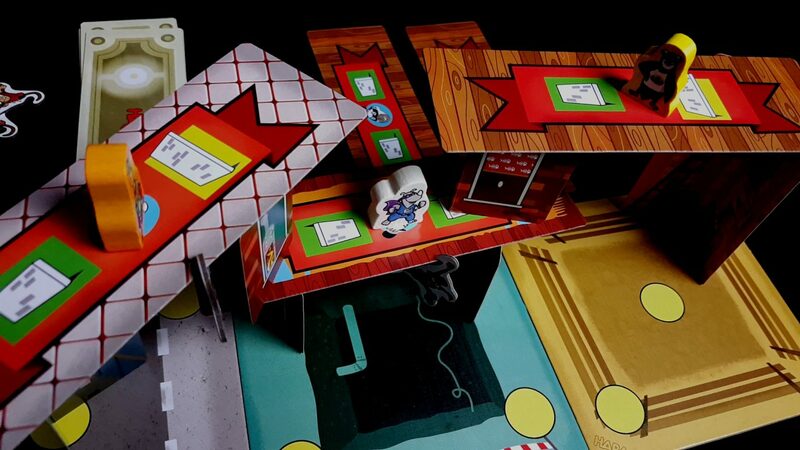 You might spend a little more on this than you would for Rhino Hero itself but I don’t think for an instant you’d find yourself regretting the extra. Unusually, I might even go an additional step and say ‘Seriously, get both – you can mix and match and that’s the best of all possible worlds’. This isn’t a circumstance where one game obsoletes the other – they can co-exist in the same game library because they are going to give you different flavours of the experience. It’s like having strawberry and chocolate ice-cream in the freezer. Having one doesn’t mean you won’t fancy the other when you finally get around to grabbing a bowl.